I kicked off the You Matter Marathon with a story about a powerful and poignant You Matter encounter between myself and a forlorn stranger in a grocery store. And now, I’d like to bring it to a close with an equally powerful and poignant story from YMM participant, Sandy S.
“When I gave my grown son a You Matter card, he was fighting to hold back tears. He simply held it and looked at it for about a minute. There was a change in his body language and I got a sense that he finally believes that he does matter in my life and is loved. We were finally able to have a meaningful conversation. The reason it made such a difference in both our lives is because of his past and where he is living now. He suffered from depression for many, many years and kept it well hidden from all of us. He had 2 suicide attempts. I found him and saved his life the first time. This was triggered by the sudden death of my husband. After that he was in trouble with the law and served jail time. Upon being released, I found him a faith-based transitional home to live in. If I would have let him move back home it would have destroyed us both. He has been there about 18 months and is doing very well. His depression is completely gone. I see him every few weeks and we have been trying to mend our relationship. It has been a long process. There has been a shift in our relationship since giving him the You Matter card. He has always been a very quiet shy person who has difficulty sharing his thoughts. Now he is opening up more. Sandy’s story is one of hundreds if not thousands of heartwarming and life changing stories to come from our YMM experiences. Together 14,382 YuMMies representing 105 Ambassador organizations, all 50 United States, and 59 countries have shared at least 431,460 You Matter cards!But while the numbers are indeed impressive, the real impact of the You Matter Marathon is incalculable and infinite. After all, who can place a value on even one of the connections made by sharing a single You Matter card. Please consider signing up for one of the 3 YMM Online Community Celebrations planned for Monday 12/5. You can click here for the details. The YMM webpage will stay active and include links for folks to print or order You Matter cards. The YMM Facebook page will stay as active as you wish it to be. I will still post there from time to time. Keep an eye out for the final YMM Update which I’ll send out next Wednesday, 12/7. 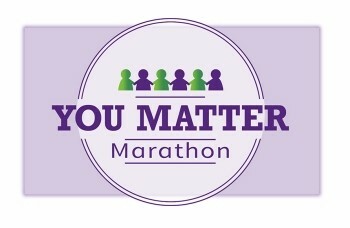 And thank you again for your generous participation in the You Matter Marathon.